Reporting your marketing efforts to your clients shouldn’t be painful or time-consuming. In fact, this is exactly what DashThis is trying to remove from marketer’s life: stressful reporting. Copy-pasting results of a Facebook campaign into an Excel file shouldn’t even happen. You spend so much time getting those results in the first place, don’t waste another minute filling in your spreadsheet’s empty cells. DashThis will do the work for you. Just set up your marketing dashboard with pie-charts, gauges, and all the other widgets you’d like, and share it easily with your clients. Automatically receiving your marketing data every month is nice. But receiving it in a beautiful and easy-to-read report… hallelujah! DashThis is the kind of tool that makes you look like an exceptional designer to your client, without actually requiring you to put in that kind of effort! Add your own logo, include comments, merge your data into simplified widgets; whether you start with our preset marketing dashboards or create your own from scratch, you can customize almost everything from the dashboard-level to the widget-level. Show your results the way you want to! Google Analytics, Facebook, Google AdWords, Instagram, MailChimp… there’s so much data to collect from so many different platforms. This shouldn’t scare you though! Get a clear picture of your multi-channel marketing campaign by merging all your valuable data into one simple marketing dashboard. An effective marketing dashboard is an incredibly valuable asset when it comes to showing your clients the results of your hard work. However, we know that it can be a time-consuming process when it's done one source at a time, one dashboard at a time. That’s exactly the reason why so many agencies and marketers have trusted us to simplify their lives: so that they can use the extra time to create more value for their clients! Our objective is clear: to keep the making of a marketing dashboard as painless as possible while still offering you the features you need. You aren’t sure of what you need exactly? Never forget that there’s a devoted and dedicated team of account managers who’ll always be there for you. Take 2 minutes to think about how much time you spent over the last few months on your marketing dashboards. Probably too much, right? If time is money, DashThis will make you save a ton! Even better: all plans include your very own account manager, available whenever you need! Get a tailor-made marketing dashboard with a custom, white label design that truly reflects you and your brand. Save on a custom URL and design with a white label bundle that includes both! 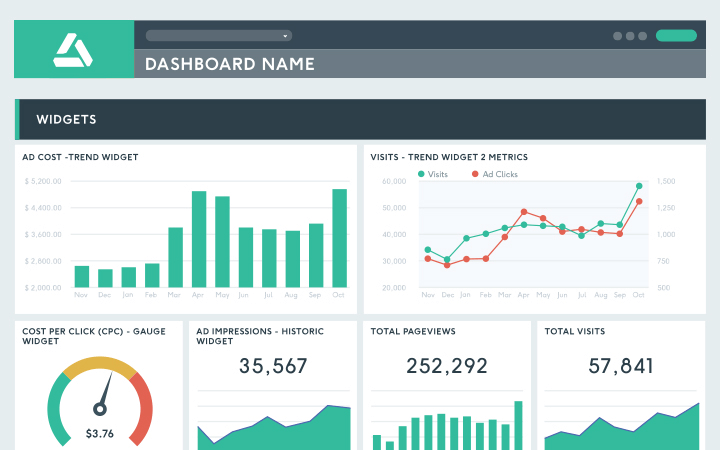 A marketing dashboard just the way you want! You work hard on your marketing, paid ads, and SEO processes, but are the results living up to your business’ expectations? Do you know which metrics you should keep track of to answer that question? SEM reporting can seem pretty complex, so this is why we’ve created a SEM dashboard template that’s bound to save your life… or at least very, very much time. Read our blog for more digital marketing related content!